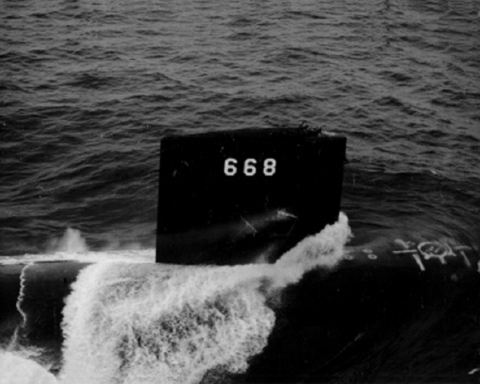 The second Spadefish (SSN-668) was laid down on 21 December 1966 by the Newport News Shipbuilding and Drydock Co., Newport News, Va.; launched on 15 May 1968; sponsored by Mrs. Charles T. Booth II; and commissioned on 14 August 1969, Comdr. G. M. Henson in command. Following shakedown in the Atlantic, Spadefish underwent post-shakedown availability at Newport News from April to June 1970 and, in July, participated in antisubmarine warfare exercises in the North Atlantic. After returning to her homeport, Norfolk, Va., the submarine was deployed in the Atlantic from October to December and then returned to Norfolk for upkeep. On 18 February 1971, she got underway for her second deployment in the Atlantic, visiting Faslane, Scotland, before returning to Norfolk on 18 April. The submarine operated in the Norfolk area for the remainder of the year, participating in antisubmarine warfare exercises and type training. For the year 1972, Spadefish participated in training operations in the Norfolk area until deploying in the Atlantic from June to August, visiting Holy Loch, Scotland, before returning to Norfolk. She again deployed in the Atlantic on 10 October and returned to Norfolk on 17 December for the holidays. Through the first six months of 1973, Spadefish operated out of Norfolk along the east coast. She conducted independent exercises, an SSBN security exercise and independent type training. In May and June, she supported Cruiser-Destroyer Flotilla 8 in a LANTREADEX and SEACONEX. At the end of June, she spent a week at Portland, England, and, in July, returned to the east coast. At the beginning of September, she commenced a major overhaul at Norfolk Naval Shipyard. Spadefish completed overhaul in July 1974 and resumed Atlantic coast operation. She was so employed through 1974 and for the first four months of 1975.